Simplicity, in both operation and installation, make this durable, economically priced paddle wheel flow meter popular. Widely accepted in fields such as irrigation, aquaculture, aquariums, koi ponds, paper mills and swimming pools. A complete range of adapters in both size and pipe schedules allows the same meter to be fitted to pipes ranging in size from ½” to 8”. Read more on the different adapters here. 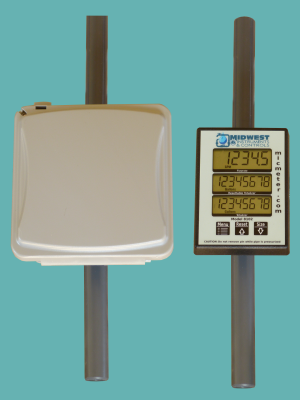 Paddle wheel flow meters are also referred to as water flow indicators. The paddle wheel measuring principal is useful when high accuracy isn’t required and cost is concern. 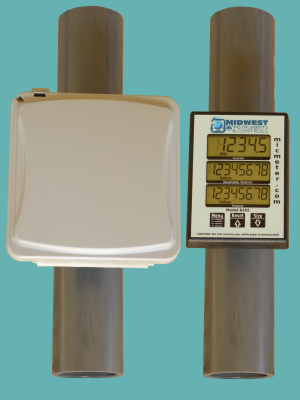 These paddle wheel flow meters/indicators will typically be accurate to within a few percent. Because the paddle isn’t completely immersed in the flow they also tolerate moderate particulate loads. For most water monitoring applications this is acceptable. 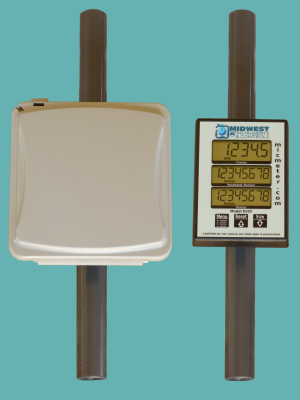 As an example, an aquarium pump and filter system is monitored by installing this meter. An operator notes the reading and compares it to the previous days value. A decline in the flow rate will commonly indicate an upcoming problem. Identifying the problem, and solving it early on, prevents loss of fish/product. Your paddle wheel flow meter will be tested/calibrated in our NIST traceable testing rack. The dimensionally critical parts of these meters are machined. Machining parts is more expensive, but dimensionally every part is identical. If every meter is identical, they should all produce an identical flow rate reading. If the meters aren’t accurate to within 1% of full scale reading, the cause is found and corrected before it is shipped to you, the customer. If the dimensionally critical parts are produced using a molding process, like many competing companies do, dimensions vary and every meter will need and be shipped with a calibration certificate. Our attention to detail assures you will receive a fully tested, accurate meter. If you require a calibration certificate please call and we will make sure you get the correct certificate. It is important to note that plumbing variables(elbows, valves, etc.) can and do affect the meter’s ultimate performance. See this link for installation notes. Better accuracy can be achieved if a on site calibration can be performed. If your metering application requires tighter accuracy a different metering principal may be required. All paddle wheel meters are similar! Be cautions of manufactures stating unreasonable accuracies or very low flow rate capabilities for their paddle wheel flow meter. Low flow rates are achievable in the laboratory. However, in real life, biological growth and silt tend to slow/stop the paddle wheel. Low or no flow rate readings will result. For your Dollar, this paddle wheel flow meter will produce good accuracy at a reasonable cost. The head of the meter can be rotated relative to the pipe mount. This rotation allows the meter to be positioned so the face is oriented vertically for proper viewing. Wide flow rate range, negligible head-loss and good accuracy continue to make paddle wheel flow meters popular. Easy removal for cleaning permit the meters to be mounted in lines with moderate particulate loads. 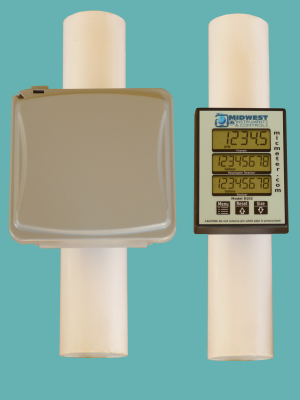 These features, coupled with a very reasonable price and free shipping, make the meters attractive for many water monitoring applications. Many times the sensor location isn’t easily accessible or viewable. 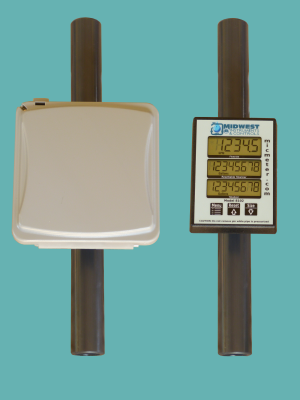 The Remote Display series of meters will aid in accommodating these locations. A cable, up to 15′ in length, separates the display from the sensor. The display can then be mounted in a location that is easily viewable. The LCD display consists of 21 large digits (1/2″ height). For convince the digits are continuously displayed. The large size makes the digits easy to read in low light conditions. A sturdy, compact, waterproof enclosure completes the design allowing the meter to be mounted outdoors. For meters mounted in the direct sunlight, we offer a sunshade option. The sunshade can be selected when adding the meter to the shopping cart. Power is supplied by a long life battery. These attributes allow the meter to be used in remote, outdoor, isolated monitoring locations. A magnet, contained in the paddle wheel, activates a sensor once per revolution. The time it takes the paddle wheel to rotate, divided into the diameter of the pipe, results in the flow rate. Flow rate variations are minimized using a digital averaging algorithm. The flow rate, a resettable and a non-resettable totalizer are simultaneously displayed. The pipe size and pipe schedule are selected from a list using the three embossed buttons on the face of the meter. For sizes not listed, the user can calibrate the water flow meter using a factor derived from the inside diameter of the pipe. Gallons and Liters are the units options. For detailed information the instruction manual can be downloaded. 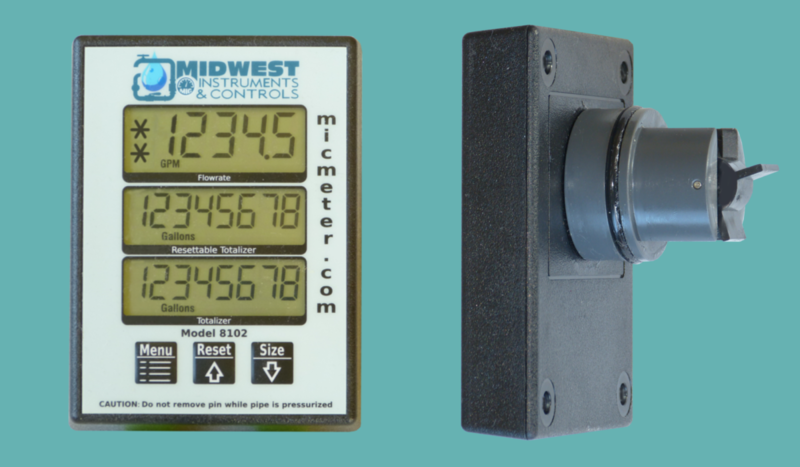 Consider these attractively priced, easily installable meters when choosing your next paddle wheel flow meter/indicator. Please call(715-523-1268) or email (info@micmeter.com) for specific application questions. 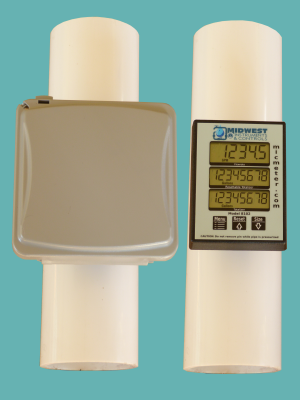 Pipe mounted flow meter supplied with a 13" long section of 1/2" schedule 80 PVC pipe. Tell Me More! 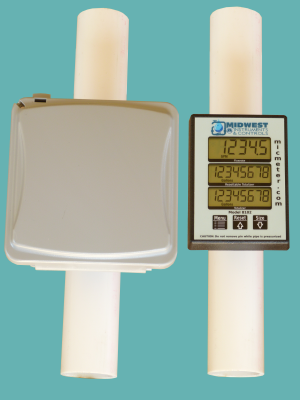 Pipe mounted flow meter supplied with a 13" long section of 3/4" schedule 80 PVC pipe. Meter Tell Me More! Pipe mounted flow meter supplied with a 13" long section of 1" schedule 80 PVC pipe. Meter Tell Me More! 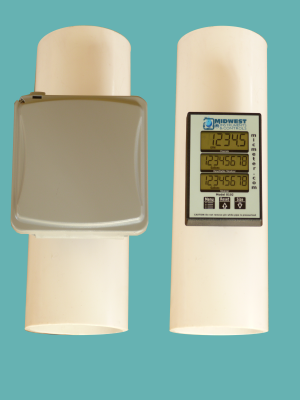 Pipe mounted flow meter supplied with a 13" long section of 1.5" schedule 80 PVC pipe. Meter Tell Me More! 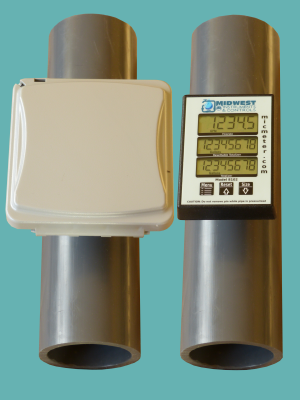 Pipe mounted flow meter supplied with a 13" long section of 1.5" schedule 40 PVC pipe. Meter Tell Me More! Pipe mounted flow meter supplied with a 13" long section of 2" schedule 80 PVC pipe. Meter Tell Me More! 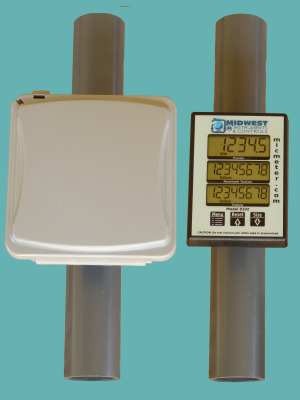 Pipe mounted flow meter supplied with a 13" long section of 2" schedule 40 PVC pipe. Meter Tell Me More! Pipe mounted flow meter supplied with a 13" long section of 3" schedule 80 PVC pipe. Tell Me More! Pipe mounted flow meter supplied with a 13" long section of 3" schedule 40 PVC pipe. Meter Tell Me More! Pipe mounted flow meter supplied with a 13" long section of 4" schedule 80 PVC pipe. Meter Tell Me More! 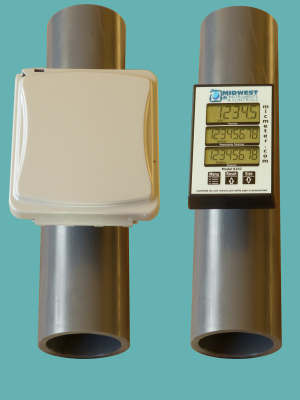 Pipe mounted flow meter supplied with a 13" long section of 4" schedule 40 PVC pipe. Meter Tell Me More!